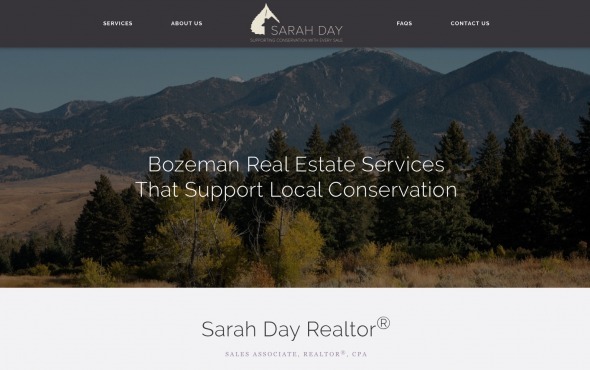 Sarah Day is passionate about helping people sell or buy property in the Gallatin Valley as well as preserving open space in the place she helps people call home. A real estate agent for Berkshire Hathaway in Bozeman, MT, Sarah is a licensed Realtor® and CPA and wanted a website that would communicate her professional skills and her values so she could attract likeminded homebuyers. The site features custom photography from local photographer Ben Johnson who captured the area’s sweeping open spaces, vast mountain ranges, and pristine rivers. We’ve also devoted a section highlighting Sarah’s homage to land conservation with the documentary On the Shoulders of Giants and her work with local non-profits, like the Gallatin Valley Land Trust, to continue the efforts of land conservation in Montana. We are happy to announce the launch of Sarah’s new website and invite you to check it out at sarahdaybozemanrealestate.com.